Steak is one of those foods that many of us love to eat, and will always order at restaurants given the opportunity, but we may not necessarily feel confident cooking steak ourselves. And it’s no wonder — google “how to cook steak” and you’ll find more than two million search results, each one advising a different cut of meat, different preparation, marinating and cooking directions. So how’s the layman supposed to know where to even begin? We asked Chef Jim to answer some basic questions about cooking steak. Instead of just answering questions, Chef Jim prepared a live demonstration in The Cork kitchen. Q: It seems there are so many nuances to cooking steak. 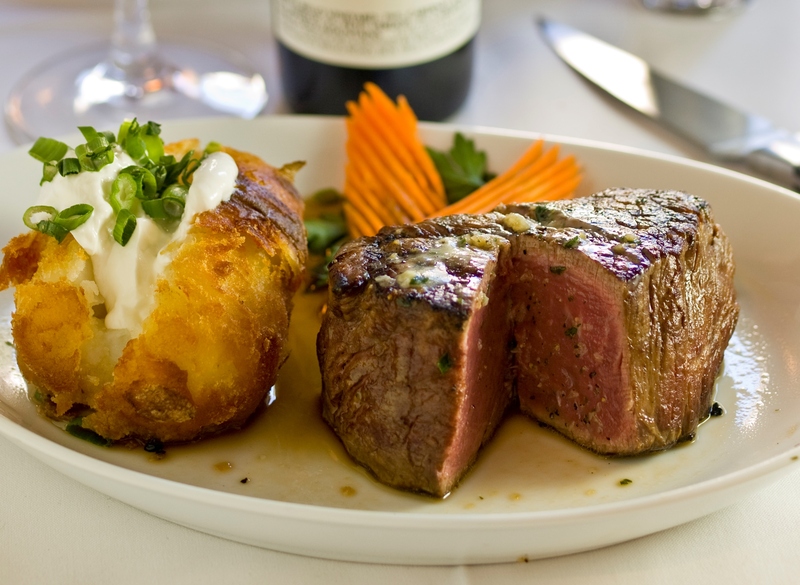 For those who want to cook a great steak at home, what do they need to know? Look, cooking steak is not a perfect science. That’s why running a quality steakhouse can be challenging. People like different cuts of meat, cooked to varying degrees of doneness, and some like to go all out with marinade or sauces. So it’s hard, but it basically comes down to buying quality beef. Q: What cut of meat should you buy when cooking steak at home? That comes down to personal preference. Some people really like the chuck end of the animal because it’s fattier. Others go for pieces of tenderloin. But here’s the deal with tenderloin: basically, half of every tenderloin is perfect; the other half is good but presents its challenges in terms of quality of meat and cooking. As you go down the tenderloin, quality can decrease dramatically. So in terms of what piece of beef to buy, here’s what I would say: ask your butcher for center cuts. Any butcher in his right mind knows exactly what that is. Don’t just walk into the butcher and say, “I want four NY strips.” If you do that, you may end up getting lesser quality meat that the butcher is looking to unload. Chateaubriand is one of the most desirable steaks — that’s a center cut. Q: OK, so ask for a center cut. How do you know if you’re getting a quality steak? Buy Choice Beef. 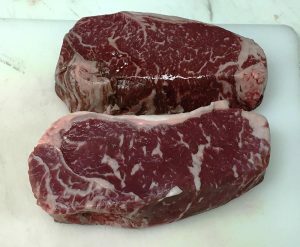 USDA Prime, while technically the best quality, can be unaffordable and hard to get your hands on. A lot of butchers don’t sell Prime cuts, and meat counters at stores may not have them. 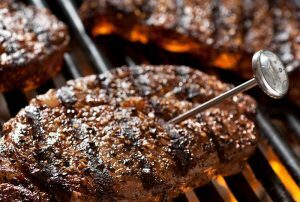 USDA Choice Beef is more affordable and the quality of the meat can be just as good as Prime. Then look for visual clues as to the quality of the cut. You’re looking for a cut that’s at least 1-inch to 1 1/2-inches thick, since a thicker cut will be juicier and less likely to get dried out during the cooking process. And make sure it has plenty of marbling — thin white threads of fat running through the meat. You want fat in your steak because that’s what keeps it moist and tender during cooking and gives it wonderful flavor. Better quality cuts will have evenly distributed threads of fat throughout the cut rather than denser chunks of fat. 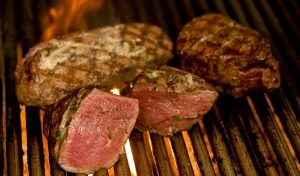 Q: When it comes to cooking steak, should the home cook grill the meat, or cook it on the stove? Let your steak warm to room temperature, then just add a little salt — really good quality salt — right before you’re ready to throw it on the grill. Brush some olive oil on the grill before you toss your steak on. Don’t keep flipping your steak all the time; let the steak cook, especially that first side. When it’s cooked to your liking, take your steak from the grill and let it rest. If you have the time and patience, give it 8 to 12 minutes to rest — believe me, it will do wonders for flavor and texture. The steak will reabsorb some of the moisture lost during cooking if you give it a few minutes after cooking. Steak doesn’t have to burn your mouth off when you eat it. So let it rest, then just add a little olive oil and a squeeze of lemon juice before serving. Polish it off with a bottle of Barolo — that’s a must! Q: How do you know when your steak is done to your liking? A digital thermometer is a must for a novice. We don’t use them here at The Cork because we are all seasoned chefs, we can tell by look and touch what’s rare or medium rare. But beginners should use a thermometer, and if you like your steak rare, take it off the grill at 124 degrees F.
What I read in food magazines is misleading: they say 130 degrees F is rare — that’s not a rare steak, that’s medium. A steak will continue to cook after you remove it from heat, so if you’re buying a $34-40 piece of meat, do yourself a favor and take it off before 130 degrees F. Let it rest. Then if it’s still too rare, you can always throw it back on the grill. Q: So if you want a really good steak, cooked to perfection — can you even do that at home? Sure. But steak is complicated, so unless you know what you’re doing, it can be frustrating. That’s why I like people to come here to The Cork for their steak. We’ve got access to quality product and the equipment to do steak well. We’ve got a double-stack broiler that’s basically a steak cooking machine. And we get great, quality cuts from our vendors. Want great steak? Visit us at the Boulder Cork! I could not find at what temperature your grill should be when you cook a steak. Once again – cooking steak is not an exact science, so I don’t have a straight-forward answer. I have a really nice gas grill at home, it’s small, being only the two of us. I can’t tell you what the actual temp is inside the grill, but I start a steak in the hottest part of the grill and move it around as it cooks. The same would be true of a charcoal grill. You have to experiment with your grill and fuel choices. Let’s discuss next time you come in to the Cork!